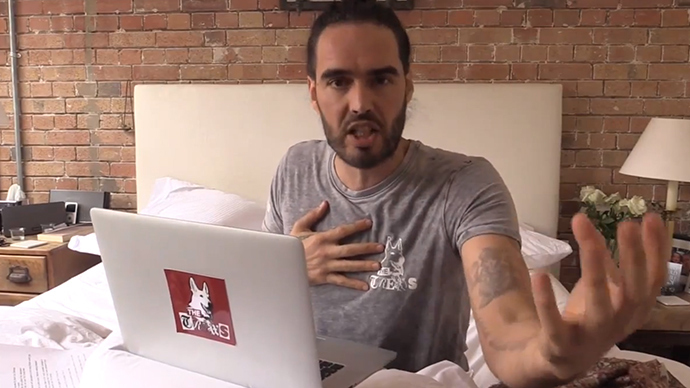 Comedian turned activist Russell Brand has blamed last week’s Germanwings plane crash on a “mental illness plague” in capitalist society, accelerated by “propaganda” media. Brand has spoken out against the media’s “stigmatizing” coverage of Andreas Lubitz, the 27-year-old co-pilot who is alleged to have deliberately crashed flight 4U 9525 into the French Alps. In the latest episode of his YouTube show, The Trews, he attacks FOX News’ coverage of the crash, branding the channel a “propaganda machine” that fuels the causes of mental health issues. Brand urges viewers to look past the co-pilot’s mental health issues as a cause of the crash and focus on it as an internal issue. After analyzing the channel’s coverage of the tragedy, Brand claims the news anchor “has an assertion” that mental illness is about “otherness,” suggesting it is not a common condition. In one broadcast, the FOX News anchor said Lubitz “looks like someone who’d rather crash a party than crash a plane,” when referring to an image of the co-pilot smiling. FOX News is a “propaganda” system which “separates us from one another and tells us the way to solve our individual problems is through purchasing, through identifying primarily through our role as consumers,” Brand claims. The channel condemns those “who are weaker,” Brand adds. @rustyrockets not many people seem bright enough to realise this is actually a go at the media's irresponsible coverage of this tragedy. “@rustyrockets: Interesting clip. If we look at #mentalhealth as a societal issue rather than blaming the individual we can move forward. The generalized assumptions the media portrays “is unfair to anyone who experiences depression,” she added. The representation “further stigmatizes mental illness and reinforces harmful stereotypes about those who experience it,” Crowley added. As the investigation of the crash is still in its early stages, “we’ll never know Lubitz’s state of mind while he was in flight,” Pete Etchells, lecturer in biological psychology at Bath Spa University told the Guardian. Murder suicide is “extremely rare” from those diagnosed with depression says Dr. Paul Keedwell, consultant psychiatrist and specialist in mood disorders. “It is committed by two to three people in every million per year,” Keedwell told the Science Media Centre. @andersoncooper Why is #CNN treating #Lubitz with such sympathy. He is a MASS MURDERER. All terrorists have mental health issues!!!
. @cnn Can you STOP reporting "mental illness" to get sympathy as to why Lubitz killed everyone? Where's your integrity? “CNN can you stop reporting mental illness to get sympathy as to why Lubitz killed everyone? Where’s your integrity?” one user asked. Liberal Democrat leader Nick Clegg, announced on Friday his party would invest £3.5 billion in mental healthcare in England if they return to office after May’s general election.